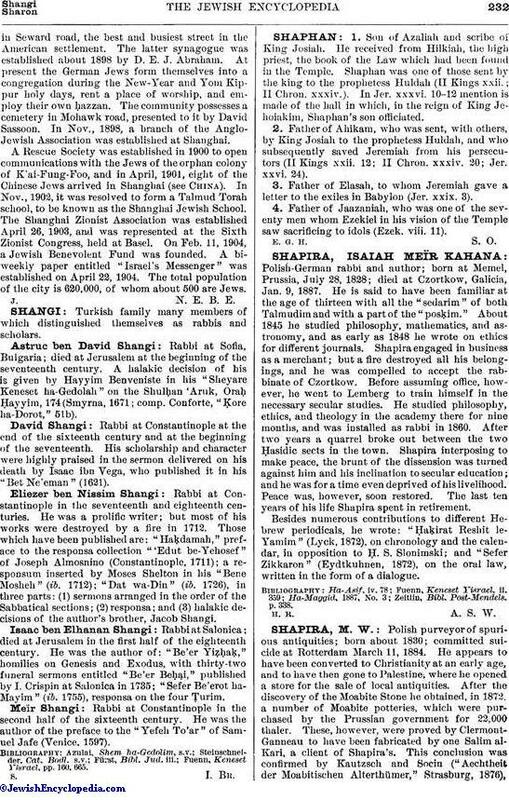 Turkish family many members of which distinguished themselves as rabbis and scholars. Rabbi at Sofia, Bulgaria; died at Jerusalem at the beginning of the seventeenth century. A halakic decision of his is given by Hayyim Benveniste in his "Sheyare Keneset ha-Gedolah" on the Shulḥan 'Aruk, Oraḥ Ḥayyim, 174 (Smyrna, 1671; comp. Conforte, "Ḳore ha-Dorot," 51b). Rabbi at Constantinople at the end of the sixteenth century and at the beginning of the seventeenth. His scholarship and character were highly praised in the sermon delivered on his death by Isaac ibn Vega, who published it in his "Bet Ne'eman" (1621). Rabbi at Constantinople in the seventeenth and eighteenth centuries. He was a prolific writer; but most of his works were destroyed by a fire in 1712. Those which have been published are: "Haḳdamah," preface to the responsa collection "'Edut be-Yehosef" of Joseph Almosnino (Constantinople, 1711); a responsum inserted by Moses Shelton in his "Bene Mosheh" (ib. 1712); "Dat wa-Din" (ib. 1726), in three parts: (1) sermons arranged in the order of the Sabbatical sections; (2) responsa; and (3) halakic decisions of the author's brother, Jacob Shangi. Rabbi at Salonica; died at Jerusalem in the first half of the eighteenth century. He was the author of: "Be'er Yiẓḥaḳ," homilies on Genesis and Exodus, with thirty-two funeral sermons entitled "Be'er Beḥai," published by I. Crispin at Salonica in 1735; "Sefer Be'erot ha-Mayim" (ib. 1755), responsa on the four Ṭurim. Rabbi at Constantinople in the second half of the sixteenth century. He was the author of the preface to the "Yefeh To'ar" of Samuel Jafe (Venice, 1597). Fuenn, Keneset Yisrael, pp. 160, 665.